Welcome to another renovation story. 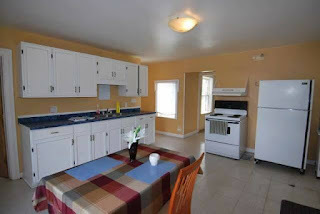 Today I'm going to share with you the before and after of my kitchen renovation. 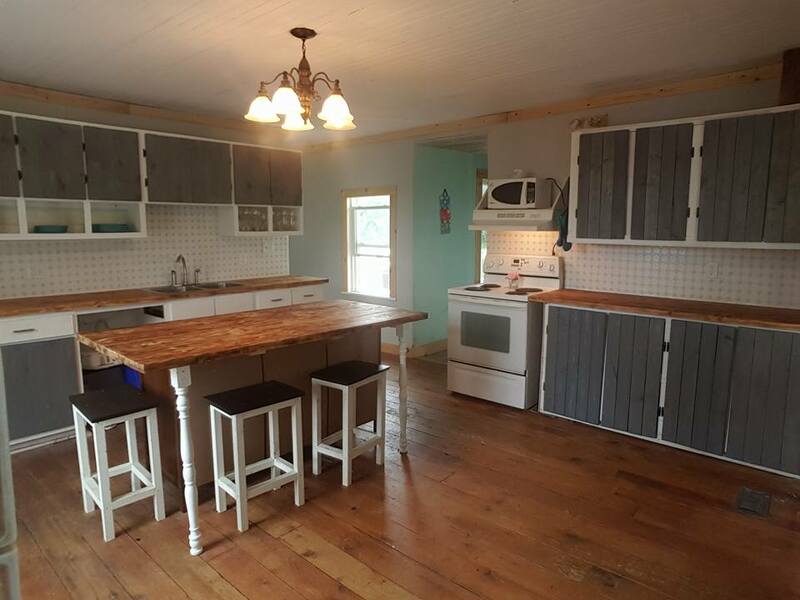 The photo above is from the listing when we purchased our home, this is what the kitchen looked like when we walked through and looked at the listing. I instantly fell in love with this house. I mean it was amazing from the outside and as soon as I walked in and saw the spacious kitchen and the envisioned all of the entertaining that could be done in here, Our New Years gatherings were going to be amazing in this kitchen, and they certainly were. 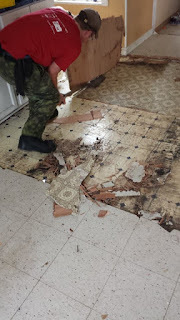 It wasn't long before the renovations had to start in this room because it turned out that there were a few layers of moldy flooring where they had an old leaky deep freeze in the kitchen. You could see by the reinforced layer they had set down on the floor and topped with metal floor transition strips... weird, should have known something was up! 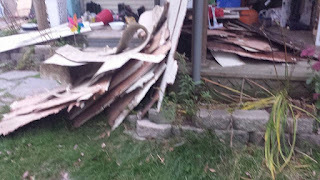 As you can see we took out a lot of flooring... FIVE layers to be exact. You could definitely see the age in the floors. 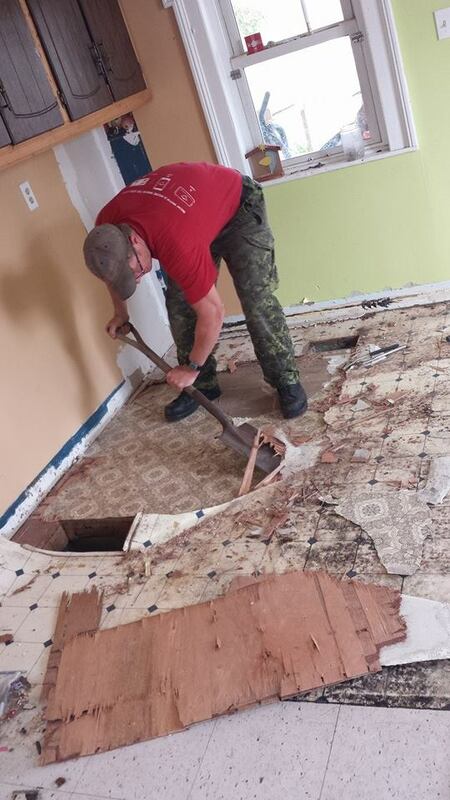 I am always fascinated when I tear up flooring and discover the years gone by. My husband and I are both fans of "original" wood flooring and if it's in a house you can be sure we are going to find it and we are going to expose it for the truly beautiful thing that it is! In this case we stripped all the levels of flooring and sanded and cleaned the floor, then applied a couple coats of Tung Oil to give it a beautiful, natural, look to it. I feel this really brought out the natural beauty of the original floor boards. Check out the "after" photo below to see the floors. Above you can see just some of the flooring we took out. What a mess! Below is my finished product. I loved my kitchen, I spent many hours sitting on that stool at the end of the island typing right here on my blog, making some customers orders, editing photographs, you name it and I likely did it sitting there. I spent A LOT of late nights snacking there, searching for our next home on Realtor.ca, when I was missing my husband. It was MY spot. And I loved it. It took a lot of convincing on my part to get my husband to agree with my vision in this room. He likes to fight me every step of the way when he doesn't know what something is going to turn out like. I on the other hand have faith everything will work out perfectly. I throw caution to the wind and I just go with it. My vision turned out beautifully in this kitchen. As we were nearing the end of renovations and getting closer to time to sell I had to stop working for awhile, which some of you likely know. I took a longer break than I had planned to but the renovations took longer than I expected, especially after my husband moved to New Brunswick and I no longer had his weekend help. The cupboard doors are stained with my favorite Varathane Stain - Weathered Grey I love to use it on my signs and it was an easy choice for my kitchen doors. Tile is 12x12 Daltile Ceramic Octagon/Dot Mosaic Tile. I loved the look of this tile and thought it would work really well with the look I was going for, as well as the colors were just perfect for my white and grey theme. I built the stools myself and painted the legs with BeautiTone Milk & Cookies paint from the Sesame Street collection of paints. The top is stained with another one of my favorite Varathane Stains - Kona. If anyone is interested I will be posting directions for the stools so you can DIY these lovely items if you'd like. I don't have a photo of the other side of the kitchen island but it was a dresser that we added our burned counter top to and then added the two legs to the front to support the overhang of the island. I will post more about doing this in another post as well. I think that's a wrap for this renovation. I am very happy with my kitchen, totally in love with the feeling it gives me to sit here and relax, cooking has never been so fun with EVERYONE being able to pitch in around the island and ample counter space. I truly believe that big kitchens like this that allow for more than one "cooker" are a great way to bring families together and have a little family time as well. Until next time... have a wonderful day/week/month/year/LIFE!